The electric vehicle is here—again! Isn’t it amazing how electric vehicles have come such a long way since being invented just a few years ago? Except they weren’t. Electric and hybrid vehicles were actually invented in the 1800s. Then, as now, the electric vehicle (EV) offered a quieter, cleaner ride than the alternatives. Today, the transportation sector contributes approximately 30 percent of global carbon dioxide emissions. Growing awareness of environmental issues, coupled with fluctuating oil prices, has renewed the public’s interest in vehicle electrification. EVs are quieter and cleaner than ever before and capable of greater distances, speeds and performance. Still, the key selling points of an EV are lower operating and maintenance costs. Only a small fraction of gasoline energy (17 to 35 percent) transfers directly to power in a gas- or diesel-powered vehicle. An EV, on the other hand, converts up to 88 percent of electrical energy to power. By cutting power to a wheel at the first sign of slippage, an EV also reduces tire wear. Fewer moving parts means an EV is optimized for stronger acceleration and smoother operation at any RPM. But wait, there’s more good news. Driving an EV costs 33 to 50 percent less than driving an internal combustion engine (ICE) vehicle, according to the U.S. DoE. Hybrid technologies can improve fuel economy by 25 percent compared to an equivalent all-diesel commercial vehicle, according to Allison Transmission. Another benefit is that series, parallel and other hybrid vehicles generate on-board electricity. Plug-in hybrids use stored energy from the grid, coupled with an ICE to extend range. Hybrids address efficiency losses via engine downsizing, recovery of braking energy, and reduction of engine stand-by losses. EVs have moved into the commercial vehicle sector in a big way. Autonomous EVs are widely deployed in remote-operator defense and mining applications, where corrosive gas and other perils may limit or prohibit manned equipment. In GPS-enabled agricultural vehicles, electric motor controls deliver tremendous advantages compared to equipment with mechanical or hydraulic levers. Many warehouse and logistics operations have migrated from diesel to electric lift trucks and tractors. ICE vehicles still have a range advantage because they are capable of more than 300 miles between refueling. EVs manage 100 to 200 miles between recharges. However, growth of private and public charging stations will fuel demand for EVs. Researchers are working to improve battery storage capacity, increase range, decrease recharge time, and improve battery longevity. And, as the price of EV battery packs goes down as the number of vehicles produced goes up, the value of commercial EVs will increase. EVs use pulse width modulation (PWM) to control power levels for motor speed control, tire braking, and electrical devices. The constant pulse modulation generates radio frequency interference (RFI). Shielding high-voltage, high-current (HVHC) systems is critical to maintain EV performance. 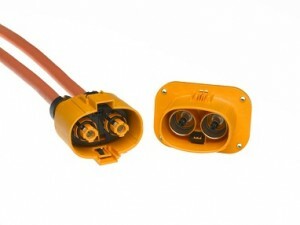 Molex offers a range of interconnect solutions for commercial electrical systems, including high-voltage battery packs, high-power inverters, converters, lead connections (robust electrical connections based on crimping or ultrasonically welding shielded cables to high-voltage, high-current terminals), and harness assemblies. For example, the Imperium™ HVHC connector delivers superior retention, current density and shielding for safe operation in extreme shock and vibration conditions. Imperium connectors provide the lowest possible shield impedance on power contacts from cable to bulkhead. Designed to connect cable shields to enclosures, Max-Loc™ Plus connectors are ideal for inverters, converters and motors in medium duty and heavy duty electrified commercial vehicles. The die-cast IP67 or IP68 or IP69 rated Max-Loc connector provides an integrated seal and shielding, while enabling fast pluggable installation on an assembly line. The future looks promising for commercial EVs. Continuing develop of key components will likely lead to lower manufacturing costs and improved performance for EVs. And even though the concept behind it is over 100 years old, electric vehicle technology is a bright new star in the commercial vehicle universe.